She had no idea she was sitting next to the very man who had penned those words years earlier. Upon remembering the song and the man he once was, Robinson broke down. With tears he replied, “Madam, I am the poor, unhappy man who composed that hymn many years ago. I would give a thousand worlds, if I had them, to enjoy the feelings I had then.” Through this encounter, Robinson was brought back into the outstretched arms of his loving God. This story of restoration at the end of sin’s winding road is neither the first, nor will it be the last. From the beginning of time, history has demonstrated that there is hope for the one who has fallen. The fact that you picked up this booklet shows that you too are seeking for that reassuring hope. I want you to know there is hope. Our failures are no surprise to God. He knows, with greater understanding than we, the creation He made. And this One, who sees our sins, also knows His purposes for us. In the Bible, God left us the complete stories of spiritual giants through whom He worked—Moses, Elijah, David and many more—just as they were, flaws and all. He did not touch up the negatives or use Photoshop to present them in a better light. There was no cover-up. Look at Moses. What an incredible life story is his—forsaken at birth and then rescued by Pharaoh’s daughter. He was raised in a powerful family of influence. As an adult, Moses’ heart was burdened for his people, and he spoke out against the cruel slavery inflicted upon the children of Israel. Unfortunately, he “ruined” what he felt God had called him to do by killing a man and subsequently spent 40 years hiding in the desert. Remember that Moses was a real human being with the same feelings as you and I. Forty years is a long time to contemplate failure. When the Lord eventually came to offer him hope and unfold His rescue plan, Moses responded that God was making a mistake and that He should look for someone else (see Exodus 4:10, 13). Elijah—the great prophet of God—was one who, in a time of terrible discouragement, simply said, “I want to die” (see 1 Kings 19:4). Talk about singing the blues! David is another classic example. This shepherd boy turned king seemed to take the worst fall of them all. This national hero who began so well, anointed by God and considered a man after His own heart, fell into adultery and then murdered the woman’s husband to cover it up (see 2 Samuel 11). Does it get much worse than that? Why does God show us the failures of these great leaders? Could it be He wants us to know that in spite of our fiascoes, He can still make something glorious out of our lives? The list of names in Hebrews 11 underscores this truth. In this passage, men and women of great faith are noted—ones whom God Almighty approved. One might be shocked, however, to discover how many of them were restored spiritually following failures such as deception, drunkenness, adultery, idolatry and murder. Consider Jacob. What a saga his life story is. From birth, God gave him a remarkable promise that he would be blessed and his older brother would serve him. With this kind of divine assurance, it would seem like Jacob would turn out to be the perfect saint. Instead, he became a crook who lied to his own father, stole his blessing and lived a life full of deceit. Jacob ended up wasting 20 precious years of his life. Toward the end of Jacob’s journey, God changed his name, which means “deceiver,” to Israel, meaning “Prince of God.” So, why doesn’t He say, “I am the God of Abraham, Isaac and . . . Israel”? How strange! How come He associates His name with a cheat who wasted two decades trying to do things his own way? The nation of Israel was betrothed to God. Yet she cast her beauty before every possible lover she could find, forsaking her true suitor. As we read through Psalm 78, we see time and again God’s faithfulness displayed in contrast to Israel’s unfaithfulness. In spite of her vulgar idolatry and the terrible offering of human sacrifices, God did not cut Israel off forever. What does God say about her? “ ‘You have played the harlot with many lovers; Yet return to Me,’ says the LORD” (Jeremiah 3:1, NKJV). Instead of deserting Israel because of her countless sins, He declares that there is hope, saying, “I will win her back once again. I will lead her out into the desert and speak tenderly to her there. I will return her vineyards to her and transform the Valley of Trouble into a gateway of hope” (Hosea 2:14–15, NLT). These are gracious words from the living God about His adulterous people. Today there is a gateway of hope. God is the original and ultimate rescuer. And for all who want to be rescued, He is able. to stop His love and mercy for you. The thief on the cross confessed that he failed miserably and admitted he deserved the horrible death he was dying. It was all over for him—hell waited, its mouth open to devour him. At least that was what he believed. Yet because of his confession and the marvelous grace of God, he made it into paradise that very day with the Son of God (see Luke 23:43). He has sent me to bind up the brokenhearted, . . . to comfort all who mourn, . . . to bestow on them a crown of beauty instead of ashes, the oil of gladness instead of mourning, and a garment of praise instead of a spirit of despair. They will be called oaks of righteousness, a planting of the LORD for the display of his splendor (Isaiah 61:1–3, emphasis mine). Maybe you are like Robert Robinson who wandered away from the God he once loved. Perhaps you revisited a sin from the past you thought you were through with. You may be living with painful memories of what once was or simply shaking your head at a sin that seems to surface too regularly. Is that your hope? Then let today mark a new beginning for you. You can read Chapter 2 next week. Or go to the Gospel for Asia website and download this book in its entirety for free. Click here. 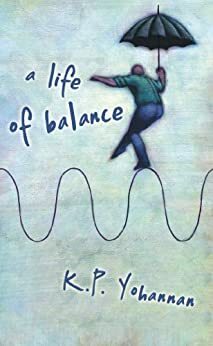 A Life of Balance © 2006 by KP Yohannan, the president and founder of Gospel for Asia. It was written with the intention of encouraging and edifying the Body of Christ. To learn more about Gospel for Asia or to receive additional free resources, visit Gospel for Asia’s website. This entry was posted in A Life of Balance and tagged Bridge of Hope, Dr. KP Yohannan, gfa, Gospel for Asia, KP Yohannan on August 23, 2017 by joseph. Our opportunities are unlimited. Beyond the challenge to spread the Gospel into developing nations, something else is far more pressing: We are totally dependent on God. If we do not look to Him but rather to ourselves to meet our needs, only disaster can result. Something wonderful happens, on the other hand, when we regard ourselves as helplessly dependent on the Lord. In our hearts and attitudes, we must remain as children before Him. If we are enabled to accomplish anything, it is because of the Lord and His grace. The secret of His blessing on any work, large or small, is that all the glory goes to Him. But we are self-willed individuals who live in flesh-and-blood bodies and strive naturally for personal praise. How can we regard ourselves as helplessly dependent on the Lord and give Him all the glory? Look at Psalm 103:14: “He knows how we are formed, he remembers that we are dust.” This verse assures me that the Lord knows the stuff I am made of. The question is, Am I able to remember it? Will I daily recognize that all I am made of is a little handful of dust? The Lord rescues us repeatedly from our tendency to stop depending on Him and start depending on ourselves. He often keeps us from doing things in our own flesh instead of in His strength. Sometimes, in His mercy, He even causes those things to fail. Because when all is said and done, when history is sealed up and time runs out, God will make sure that nothing that is a product of the flesh will last for eternity. He has never accepted a work of our flesh and He never will, however good it might look to us. Nothing, not preaching thousands of sermons, not even seeming to turn the world upside-down, will enter eternity if it has been a product of our flesh. Anything lasting for eternity will have been done by Him and Him alone. We are no different than the children of Israel. Take a look around you at the people and ministries you know God has called to do His heart’s desire. Often flesh gets in the way. People become arrogant and take the glory for themselves. When the Lord uses people for His purposes, He often has to strip away dependence on intelligence, education, abilities, strengths. He has to make them nothing before He can build them back up again for His service. It is refreshing to see how God carries along a person or ministry that acknowledges dependence on Him. Some things we plan never take place. Other things we never expect may happen in a mighty way. This helps us know beyond a shadow of a doubt that God has accomplished these things. Excerpt from Chapter 12 of Living in the Light of Eternity (ISBN 9781595891402) © 2014 by KP Yohannan, the president and founder of Gospel for Asia. This entry was posted in Living in the Light of Eternity and tagged Christian-living, Christianity, Deeper-life, Discipleship, Dr. KP Yohannan, gfa, Gospel for Asia, Jesus, K.P. Yohannan, KP Yohannan, Spirituality on January 29, 2015 by gfaseo. Jesus compared the kingdom of heaven to “a merchant looking for fine pearls. When he found one of great value, he went away and sold everything he had and bought it” (Matthew 13:45–46). What does it mean to give up everything for the pearl of great price? I want to convey that your choice to live for Jesus is not just a means to escape hell. It is not just to have your sins forgiven or to have a nice, comfortable life here on earth with good fellowship and a free ride to heaven. Life for Jesus is a spiritual battleground. Like it or not, we are in the enemy’s territory. Jesus Himself was harassed continually by the powers of darkness and the enemies of the Gospel. He had no nice place to lay His head. He was misunderstood and rejected. He was often left alone, particularly at the hour of His greatest need. He died daily, and on the cross in great agony. Paul and the other apostles followed in His footsteps. Am I saying you are more spiritual if you walk around in rags and alienate yourself from society? No. And I do not want you to assume from what I am writing that giving up “rights” or comforts is all there is to life in Christ. Every truth in this world stretched beyond its limits will become a false doctrine. But when you commit yourself to live for Jesus, you cannot live just like everyone else. You must follow the Lord closely day by day. Only He can provide the balance you need. This is why we are told in the Word of God that “those who are led by the Spirit of God are sons of God” (Romans 8:14). As we walk through this life, we can choose to be led by the Spirit, or we can choose to be led by our own logic, by other people’s opinions or by our own flesh. Our flesh will do a lot of good-looking things—a lot of praying, a lot of fasting, a lot of giving up. But the Word of God says, “If I give all I possess to the poor and surrender my body to the flames, but have not love, I gain nothing” (1 Corinthians 13:3). If we are not controlled and led by love for God, all the “right” outward behavior amounts to nothing. Since love is a fruit of the Holy Spirit, we must be filled continually with the Holy Spirit and led daily by Him. Since your life is short, what will you leave behind? A few pieces of jewelry, a house, some cars, land, investments, money in the bank? Or will you leave more than that? What about a son or daughter who is serving the Lord somewhere in the world? What about the memory that you lived for Jesus with all your heart—that you gave Him all you had and all you were to gain His kingdom? What about the knowledge that you gave all you could to reach the lost and dying souls of the world? Jesus told His disciples the cost of the pearl of great price: “If anyone would come after me, he must deny himself and take up his cross and follow me” (Matthew 16:24). May you find the willingness in your heart to sell all you have for the pearl. This entry was posted in Living in the Light of Eternity and tagged Christian-living, Christianity, Deeper-life, Discipleship, Dr. KP Yohannan, gfa, Gospel for Asia, Jesus, K.P. Yohannan, KP Yohannan, Spirituality on January 8, 2015 by gfaseo. There are times in our lives when we have more questions than answers. Our emotions are dry and cold. Nothing gives us reason to get excited or happy about serving God. What do we do? Times like these are part of the battle. They are when “the righteous will live by his faith” (Habakkuk 2:4). In every battle we face, we need to keep in mind that faith is the key that helps us overcome the world and the enemy. “This is the victory that has overcome the world, even our faith” (1 John 5:4). After spying out the land of Canaan, Joshua and Caleb said, “Let’s go!” Caleb in particular was a radical revolutionary who told Moses and the people of Israel, “We should go up and take possession of the land, for we can certainly do it” (Numbers 13:30). What did the other 10 spies say? “This is impossible! We can’t do it. We saw giants in the land, and we ourselves are grasshoppers in comparison” (see Numbers 13:33). Caleb lived his whole life following the Lord. When he saw the land of Canaan, he had no doubt that the children of Israel could possess it—not because he was confident in their might, but because he was confident in God’s ability to go beyond any weakness or frailty. God honored Caleb’s faith and gave him a special inheritance in the Promised Land because, as Moses told him, “You have followed the Lord my God wholeheartedly” (Joshua 14:9). If you know anything about faith, you know there is something innate in us that works against faith, even in the most knowledgeable theologian or the most powerful preacher. “The man without the Spirit does not accept the things that come from the Spirit of God, for they are foolishness to him” (1 Corinthians 2:14). No matter how much we read and memorize the Bible, our natural mind always comes up with some argument against God’s way of doing things. This is why exercising faith is so important. When you pray for an unsaved loved one, for revival in your church, for the unsaved to be reached with the Gospel, remember what Jesus said: “Believe that you have received it.” When God told Abraham he would have a son, Abraham not only believed it but began to thank God. Later on he received his son. I encourage you to exercise your faith actively in what God is able to do. Go beyond your natural thoughts and reactions. Trust Him, in obedience to what His Word says, for miracles far greater than what your mind could ever imagine. Excerpt from Chapter 8 of Living in the Light of Eternity (ISBN 9781595891402) © 2014 by KP Yohannan, the president and founder of Gospel for Asia. This entry was posted in Living in the Light of Eternity and tagged Christian-living, Christianity, Deeper-life, Discipleship, Dr. KP Yohannan, gfa, Gospel for Asia, Jesus, K.P. Yohannan, KP Yohannan, Spirituality on December 3, 2014 by gfaseo. Throughout the Bible human beings are compared to sheep. Do you remember what one of the predominant characteristics of sheep is? They stray quite a bit. If left to our own devices and if we do not watch our hearts diligently, we, too, will always head the wrong way. It may take months or even years, but eventually our actions will follow the direction of our hearts. We will find every reason under the sun to justify our actions and choices until finally we are out of the battle, no longer serving or even following the Lord. It does not matter how powerful and influential you are, how much education you have, how self-controlled or holy you consider yourself—your heart, if you do not guard it, will break down. I have seen this principle played out too often in individuals’ lives and in the Church at large. Many churches have drifted from the heart of the One they call Lord and Master. Now, instead of making it a priority to rescue the lost millions of the world from a Christless eternity, their programs revolve around themselves. They put their own agenda—whether buildings or staff or special programs—as first priority in their budgets. Missions falls somewhere down the list. Rescue those being led away to death; hold back those staggering toward slaughter. If you say, “But we knew nothing about this,” does not he who weighs the heart perceive it? Does not he who guards your life know it? Will he not repay each person according to what he has done? Our tendency as horizontally oriented humans is to forget the war going on behind the scenes and interpret everything in our lives through the filter of our five senses—what we see, hear, smell, touch and taste. Anything that has to do with these senses is our first approach to solving problems. Circumstances dictate how we feel and what we do. And we think in terms of ourselves rather than in terms of the purpose God has given us as believers. We have strayed from the focus of our hearts. But we are not created for time. We are created for eternity. Our lives right now are little classrooms in which we are learning to be conformed to the image of the Lord Jesus Christ (Romans 8:29). And why did Jesus come into this world? What did He live for? “To seek and to save what was lost” (Luke 19:10). Everything else in life becomes incidental when we gain this focus. Clothes, food, hairstyle, makeup, bank account, education, degrees, plans, ambition, spouse, children—none of these can possibly be the most important thing in life. The more we become like Christ, the more we, like Him, will make world evangelism the top priority in our lives. I urge you to examine your own heart. Look at the things you do and the activities you are involved in for the sake of the Lord. Ask yourself honestly, Why am I doing this? Search your heart. Be real with yourself. In the normal course of human nature, things never improve. We begin to take the things of the Lord casually. We find all sorts of reasons why our thinking is correct and why we should justify ourselves and our behavior. And unless we allow the Holy Spirit to renew our hearts and minds continually, deterioration will set in. It is like putting sand into the gears of a machine. They still crank, but the grinding noise is constant, and the machine must work harder for anything to happen. With the many needs and opportunities on the mission field, please do not let your involvement stop with “I’m doing the best I can.” As followers of Jesus, the things we do—whether praying, giving, sending or going—determine to a great extent what happens on the other side of the world. So I encourage you to search your heart. Is the passion still there? Is your heart broken? No one can restore that freshness or passion for you. You must come before the Lord and allow Him to renew the focus of your heart. This entry was posted in Living in the Light of Eternity and tagged Christian-living, Christianity, Deeper-life, Discipleship, Dr. KP Yohannan, gfa, Gospel for Asia, Jesus, K.P. Yohannan, KP Yohannan, Spirituality on November 18, 2014 by gfaseo. It is easy to get out of touch with God and try to live the Christian life on our own. We all fall into it. But when we realize what has gone wrong, how do we go about mending it? In Revelation we read Jesus’ message to the church in Ephesus—an incredible passage that can turn your stomach inside-out! If you remember the story of the Ephesians from Acts 19, you know that when Paul preached the Gospel to them, a great number believed. They brought their sorcery books, worth 50,000 pieces of silver, and burned them publicly. They took a stand against darkness and committed themselves to Christ, separating themselves from their former ways of living. I know your deeds, your hard work and your perseverance. I know that you cannot tolerate wicked men, that you have tested those who claim to be apostles but are not, and have found them false. You have persevered and have endured hardships for my name, and have not grown weary. Yet I hold this against you: You have forsaken your first love. Remember the height from which you have fallen! Repent and do the things you did at first. If you do not repent, I will come to you and remove your lampstand from its place. At first it sounds confusing, doesn’t it? But Jesus was saying something was missing in the Ephesians’ lives. They were laboring the same as always, but their inner motivation had changed. It was no longer “labor prompted by love” (1 Thessalonians 1:3). They had forsaken their first love. I encourage you to take this first step of repentance. Excerpt from Chapter 6 of Living in the Light of Eternity (ISBN 9781595891402) © 2014 by KP Yohannan, the president and founder of Gospel for Asia. 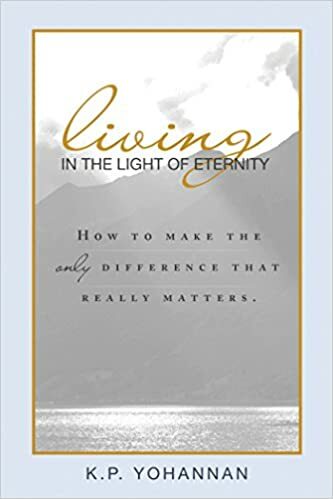 This entry was posted in Living in the Light of Eternity and tagged Christian-living, Christianity, Deeper-life, Discipleship, Dr. KP Yohannan, gfa, Gospel for Asia, Jesus, K.P. Yohannan, KP Yohannan, Spirituality on November 4, 2014 by gfaseo. Strangely enough, the person who has lost authentic vertical motivation from the Lord falls into legalism. The love of Christ no longer constrains him. He works for the sake of the work alone, whereas true motivation in working for the kingdom of God is love. Love is the oil that keeps the machinery running smoothly. With this motivation there is no murmuring, no complaining, no grouchiness. People motivated by the love of God can serve Him 24 hours a day and be the happiest people in the world. They cannot do enough for the Lord because they love Him so much. When you lose that vertical motivation, you are doing things for the Lord because you have to. When a person loses the love motive of his heart, he sees the Father as mean and unfair. He begins to compare service records. In the story of the prodigal son, the older brother compared his work with that of his younger brother, who wasted and destroyed everything his father had given him. The father, weeping and rejoicing over his younger son, pleaded with his elder son to come in. But the son refused. His unyielding, headstrong disposition is a clear indication that he was not motivated by love for his father. He refused to go in because he felt sorry for himself. He was bitter about his situation. And he was discouraged. But self-pity, bitterness and discouragement have nothing to do with genuine vertical motivation. The older brother had little feeling for his father or brother. His feelings had festered so long that he could think only about himself. A person not motivated by love for the Lord will experience jealousy over others’ blessings and the desire for honor and position. He may want to be noticed by others, looking for opportunities to tell them what he has done. He may be dissatisfied with second place. Or he may secretly expect appreciation or approval. When our hearts are not motivated by love, our relationships with others are strained. The older brother had apparently been content working in the fields day after day. But when his brother came home, he became jealous. Now that this brother of mine has returned, he thought, look at the hugs, the ring, the shoes, the new clothes. Look at the feast, the dancing, the celebration. All the attention I’ve gotten, all the benefits I’ve received, all my father’s love, will now be turned to him. It is a sign of true godliness to desire nothing but the Lord Himself. It is no simple thing to take second place and let someone else get the honor. It can be done only by someone who loves God. This entry was posted in Living in the Light of Eternity and tagged Christian-living, Christianity, Deeper-life, Discipleship, Dr. KP Yohannan, gfa, Gospel for Asia, Jesus, K.P. Yohannan, KP Yohannan, Spirituality on October 15, 2014 by gfaseo. The man stopped hoeing and straightened up, wiping sweat and grime from his forehead. He thought he had heard unusual sounds coming from the house. Strains of music drifted across the field and, he thought, shouts and laughter as well. What was going on? Well, it was way past quitting time anyway. He swung the hoe over his shoulder and trudged over the freshly turned-up field toward the house. As he drew nearer, the music grew louder. He could tell the wine must be flowing freely; the dancing and merriment were in full swing. Father must have a real reason for celebration, he thought. Just then a servant came scurrying out. The man’s face darkened. So this was what they were celebrating—his brother’s return? His irresponsible, wild, loose-living, inheritance-wasting brother? How dare he return after all the years of grief and uncertainty he had caused! A storehouse of angry memories flooded him. And he turned on his heel. We are all familiar with the story in Luke 15 of the man and his two sons. We know the younger brother as the Prodigal Son, but the story is really about the love of his father. It is plain to see that the younger son represents the sinner, the outcast. But let’s take a closer look at the older son. The older son is a picture of the believer, someone who knows the Lord and is within the fold of believers. What was he doing when the younger son finally returned? Working out in the fields. He was committed to his father and to his work. In appearance, anyhow, he loved his father more than his brother did. He never left home or gambled his money away. The older brother is a classic illustration of the individual who seems to be doing a lot of good and whose life is full of activity but who may be motivated horizontally, not vertically. The motivation keeping the older brother going was not genuine love for his father. When his brother returned and adverse circumstances bore down on him, the truth came out. The older brother was “perfect.” He sacrificed and worked long hours. He gave money faithfully for missions every month. He cut back on his lifestyle and lived more simply. He prayed an hour every day. He was active in his church. He always went the extra mile. Am I talking about you and me? I am. But as we are in the midst of good activity, sometimes things begin to go wrong. Wow! we say to ourselves. I didn’t realize I would ever face rejection for doing the right thing. I thought everyone would appreciate my hard work. I thought I’d get a few rewards, a little recognition . . . When external pressures bear upon us and jolt the jar, whatever is inside comes out. This jolting is orchestrated by the Lord, who wants us to see what is really in our hearts. Why did the older son act the way he did? He felt taken for granted, and was angry with his father for receiving his younger brother back, who had done wrong while he had done right. If we look carefully at Luke 15, we can see signs that something was missing in the older brother. He had lost the genuine motivation of his heart—his love for his father. This entry was posted in Living in the Light of Eternity and tagged Christian-living, Christianity, Deeper-life, Discipleship, Dr. KP Yohannan, gfa, Gospel for Asia, Jesus, K.P. Yohannan, KP Yohannan, Spirituality on September 30, 2014 by gfaseo. We can prove our faith by our committal to it, and in no other way. Any faith that does not command the one who holds it is not a real belief; it is a pseudo belief only. And it might shock some of us profoundly if we were brought suddenly face to face with our beliefs and forced to test them in the fires of practical living. Many of us Christians have become extremely skillful in arranging our lives so as to admit the truth of Christianity without being embarrassed by its implications. So wide is the gulf that separates theory from practice in the church that an inquiring stranger who chances upon both would scarcely dream that there was any relation between them. An intelligent observer of our human scene who heard the Sunday morning sermon, and later watched the Sunday afternoon conduct of those who had heard it, would conclude that he had been examining two distinct and contrary religions. Christians habitually weep and pray over beautiful truth, only to draw back from that same truth when it comes to the difficult job of putting it in practice. When we hear the New Testament with willing, open hearts, the Gospel will penetrate our very lives and break them open, energizing our eyes, our ears, our hands, our legs—every part of us. And when we allow the Gospel to energize us, we become vessels in the Lord’s hands, pouring out our prayers, finances, reputation, lifestyle—and ultimately our very lives. Do we have to be “somebody” to hear the call of God and make a difference? In my own life I have seen time and again how God uses “nobodies.” Sometimes I feel insecure. At other times I feel overwhelmed with all that I know needs to be done. Again and again I struggle and fail. Perhaps you feel you are useless to the Lord, that you are not good enough, or that you have already wasted your life. But you are still in His hand. Don’t you know that every day with Jesus is a new beginning? The Lord never condemns you or says, “Sorry, you didn’t make it.” His mercies, He tells us, are new every morning (see Lamentations 3:22–23). Whether you have lost 7 days or 70 years, the Lord says to you, “Return to me with all your heart. . . . I will repay you for the years the locusts have eaten” (Joel 2:12, 25). The Lord does not ask you to be a success or a superstar. In fact, if you truly desire to be a world-changer give your weaknesses to God so He can use you. All He requires is a weak, brokenhearted child who will surrender at the foot of the cross. Excerpt from Chapter 3 of Living in the Light of Eternity (ISBN 9781595891402) © 2014 by KP Yohannan, the president and founder of Gospel for Asia. This entry was posted in Living in the Light of Eternity and tagged Christian-living, Christianity, Deeper-life, Discipleship, Dr. KP Yohannan, gfa, Gospel for Asia, Jesus, K.P. Yohannan, KP Yohannan, Spirituality on September 10, 2014 by gfaseo. Once your life is given over completely to the Lord, you will no longer be intimidated by circumstances or swayed by what others think. Paul said, “All things are yours, whether Paul or Apollos or Cephas or the world or life or death or the present or the future—all are yours, and you are of Christ, and Christ is of God” (1 Corinthians 3:21–23). Paul also said, “No matter how many promises God has made, they are ‘Yes’ in Christ” (2 Corinthians 1:20). When the Lord calls you to consecrate your life to Him, He is looking for a living, breathing, moving sacrifice. He wants a total surrender of your will, your intellect, your mind, your five senses, your emotions, your actions. I urge you, brothers, in view of God’s mercy, to offer your bodies as living sacrifices, holy and pleasing to God—which is your spiritual worship. Do not conform any longer to the pattern of this world, but be transformed by the renewing of your mind. Then you will be able to test and approve what God’s will is—his good, pleasing and perfect will. What will you do with your self? Many men and women are still in darkness, trying to figure out the meaning and purpose of life. But no matter what you try to do with your self—whether you deny it, obliterate it, annihilate it, accept it or express it—believe me, it is still alive and kicking. Jesus tells us what to do with the self: “If anyone would come after me, he must deny himself and take up his cross daily and follow me” (Luke 9:23). But questions remain: How do we follow Him? How do we hear God and implement the power of the Gospel in our lives? This can happen only through an all-out surrender of ourselves to the Lord Jesus Christ. It means acknowledging the Lordship of Christ in our lives, not just in theory but in practice. Jesus asks us to love Him supremely, more than anything or anyone else, and to let Him live in us and through us. Paul expressed it beautifully: “I have been crucified with Christ and I no longer live, but Christ lives in me” (Galatians 2:20). When I let Jesus live in and through me, my self is no longer the one that directs and dictates to me. Now it is Christ, His will and desires, living and acting through me. This is why the habit of compartmentalizing our lives must end. All of me, all that I am, belongs to Christ. It is a daily practice to learn this principle and live it out in our lives. The choices we make are ultimately not collective ones that we make as a church, a family or even a couple. They are choices we make as individuals. I pray that you will take a closer look at who you are. From now on you can live your life for a different purpose than for this world alone. I pray that you will hear the call of God and begin to consider eternity as your perspective. But I must also warn you: If this is your decision, know that you have chosen to walk a narrow road. When Jesus called His disciples to follow Him, He set some conditions before them. The choice you make to follow Christ involves a cost. There will be inconveniences, difficulties, pain and counterattack by Satan. But praise the Lord, whether you are standing or have fallen, you can rejoice because you have surrendered your self to Him. When everything has been said and done, and the earth as we know it is only a memory, Jesus will say to you, “Well done, good and faithful servant.” And His approval is all that matters. Excerpt from Chapter 4 of Living in the Light of Eternity (ISBN 9781595891402) © 2014 by KP Yohannan, the president and founder of Gospel for Asia. This entry was posted in Living in the Light of Eternity and tagged Christian-living, Christianity, Deeper-life, Discipleship, Dr. KP Yohannan, gfa, Gospel for Asia, Jesus, K.P. Yohannan, KP Yohannan, Living in the Light of Eternity, Spirituality on September 2, 2014 by gfaseo.